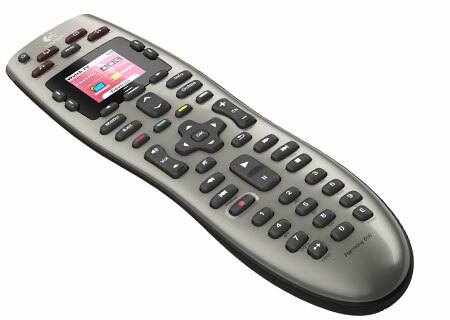 A universal remote with a color screen and one-click activity buttons that bring you showtime in no time. You’ll see just what you need, like icons for your favorite channels as well as the commands you need for the devices you’re using. The smart display can even provide help if you need it. No more complicated lists of what to turn on or which button to select. Once you’re set up, you just select what you want to do—such as “Watch a DVD”—and your Harmony does the rest. You connect your remote to your computer and tell us what equipment you have. Then sit back and let our online software walk you through the setup process. If you have any questions, Harmony customer support is ready to help. Whether you have an aging VCR or a brand new Blu-ray player, you can be confident your Harmony remote will control the devices you have today and the ones you add tomorrow. Your remote won’t become obsolete when manufacturers release new products or when you buy a new TV or add a Blu-ray player to your setup. Buttons are grouped by how you use them, shaped so you can feel your way around, and backlit—so you always know where you are.